This recently popped up and is claimed to be of a 1965 Shelby GT350 at the Chicago Auto Show. Anyone familiar with it? It looks real judging by hair styles and clothing worn that appears to match the times. Though I live in Chicagoland who knows if it is specifically the Chicago Auto Show. It's currently on eBay along with a few other pictures (no more Shelby's though), so I'm pretty sure it's real. Here is another picture from Mustang Monthly showing the Chicago Show. 5017 was purchased by a guy from New Holstein, WI of all places, in 1968! And at that time I was a 13 year old living only three miles away in Kiel and building models of Shelbys! WHO KNEW?? I had no idea the car was there until I moved to Green Bay in 1974 and met Jim Cowles (who later restored the car). PS - Porthole Venice hood!! 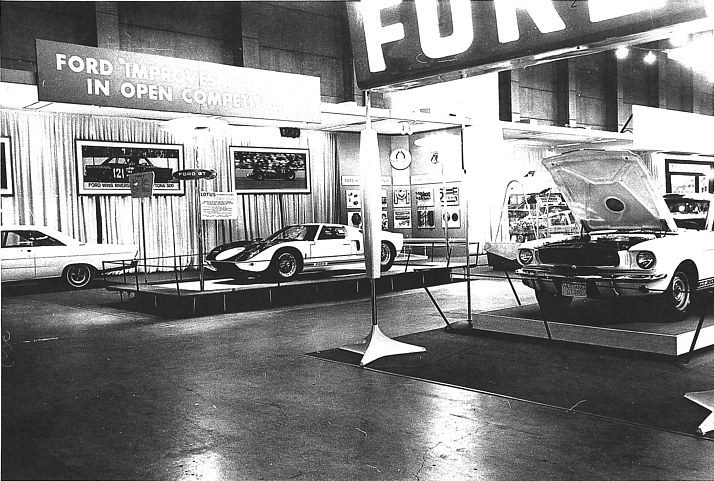 I remember standing by that Ford GT. Must have stood there gauking for five minutes. Yeah, the GT 350 was cool, but...Ford GT!! Lets see, 1965 minus 1952. I was right on the edge of turning 13 then. So I won the auction on eBay and received them today. Thought you all might enjoy. If anyone is interested, I can email a high res scan of either if you like. No charge, lol. It is 17. A high res would be most appreciated, it will go with my set of 2 originals. I am going to reach out to Su (no e) who took those to see if she still has the negative.